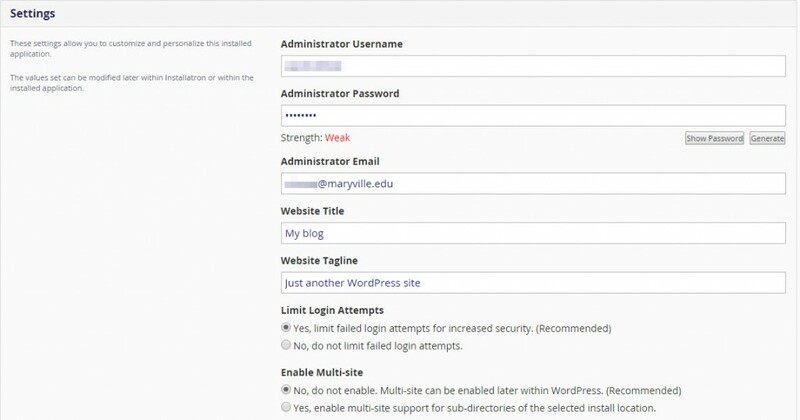 Follow these steps to install WordPress from your cPanel. 1. Log in to your cPanel via musites.org/dashboard. 2. In the Web Applications section, under Featured Applications, click WordPress. 3. Click install this application. 4. On the Install page, confirm your domain name automatically appeared in the Domain text box. Leave the Directory text box empty. 5. In the Settings section, change the Administrator Username and Administrator Password to something you can easily remember. To change each, double-click to highlight the text, and then type the new username or password. Click Generate to obtain a system-generated password. 6. The remaining settings can be changed later. Click Install. 7. WordPress takes a few minutes to install. 8. Once WordPress is installed, an email is sent to your Maryville.edu address acknowledging the installation. The email includes your website address and your WordPress admin dashboard address. Or, you can view your new website by clicking the first link on the Installatron page.